We now have a complete Ski-doo Clutch tool service package. This combination of Straightline Performance and Hot Rod Sled Shop tools includes a TRA primary spring compressor, a QRS spring compressor, clutch puller, clip set, and a QRS torx tool. 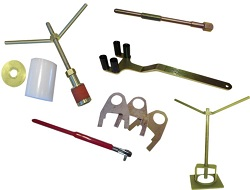 These are shop quality, cadmium plated tools that will last a lifetime. This kit will work on most Ski-doo clutches from 1999 to 2016.